Synfig Studio 2D animation software added to Graphic directory. 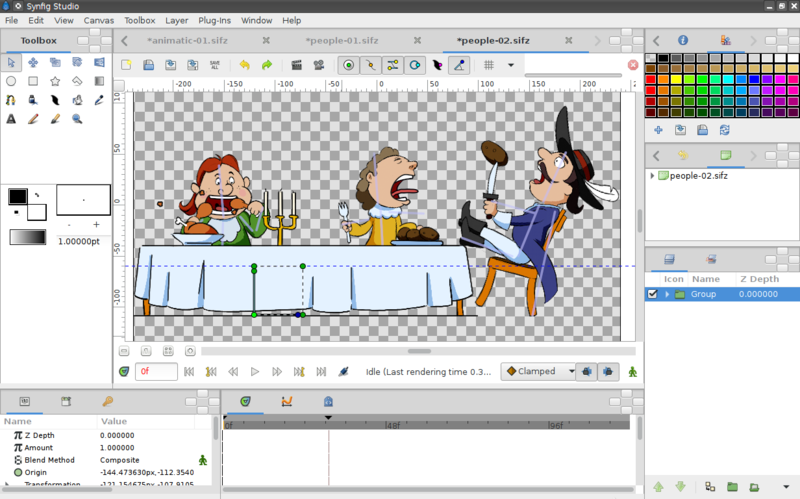 Synfig Studio is a free and open-source 2D animation software, designed as powerful industrial-strength solution for creating film-quality animation using a vector and bitmap artwork. It eliminates the need to create animation frame-by frame, allowing you to produce 2D animation of a higher quality with fewer people and resources. Most elements are vector-based, and all layers are parametrically generated, hence even when changing the target resolution of a project, the only pixelation will occur in imported raster images, not the built-in components. By using floating-point math in the image calculations, HDRI processing allows canvases to internally understand a far greater range of pixel luminance, resulting in better lighting effects, and improved color composition. The draw tool already reads the pressure sensitivity channel off your favorite tablets, for natural line weighting, and more to come! While it may not be obvious in this early state, Synfig (and its proprietary predecessors) has been designed from the ground up with animation workflow in mind. Unlike purely SVG-based vector software, and most consumer-level animation programs, Synfig has full support for gradient paths - gradients that follow along a drawn shape. This allows artists to easily add soft shading to animation without the trouble of painting it onto every frame. Synfig supports a multitude of layers of various types; geometric, gradients, filters, distortions, transformations, fractal and a few others. Use the full-featured bone system to create cutout animation using bitmap images or control your vector artwork. Apply complex deformations to your bitmap artwork using the new Skeleton Distortion layer. Cut your bitmap images right in the Synfig! The new Cutout Tool provides the non-destructive editing, so you never have to worry about cutting a wrong part. The new Sound Layer provides basic features for syncing your animation with soundtrack. Enhance your animation with automatic friction effects using the new Dynamics converter.